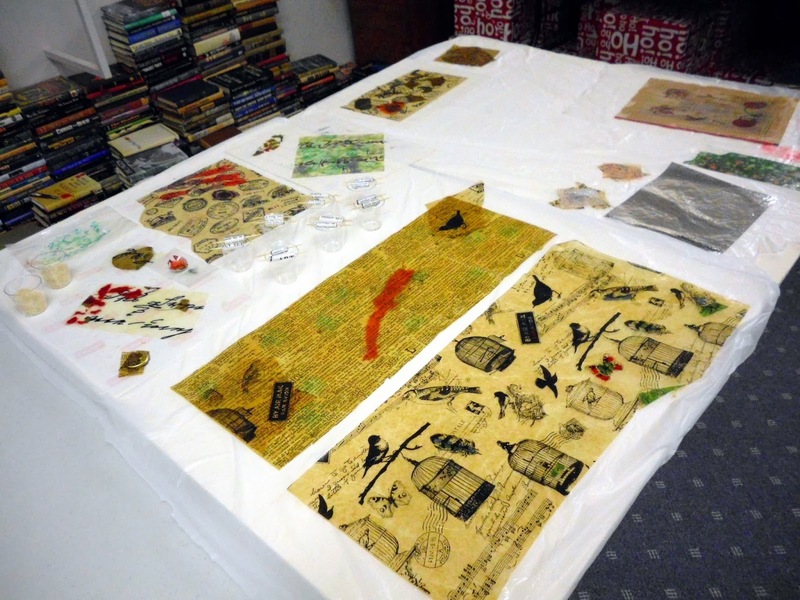 Last week I visited with my friend Marianne in her craft studio. What a great place to create Art and a mess at the same time! That is my definition of a real studio. We started early in the day. 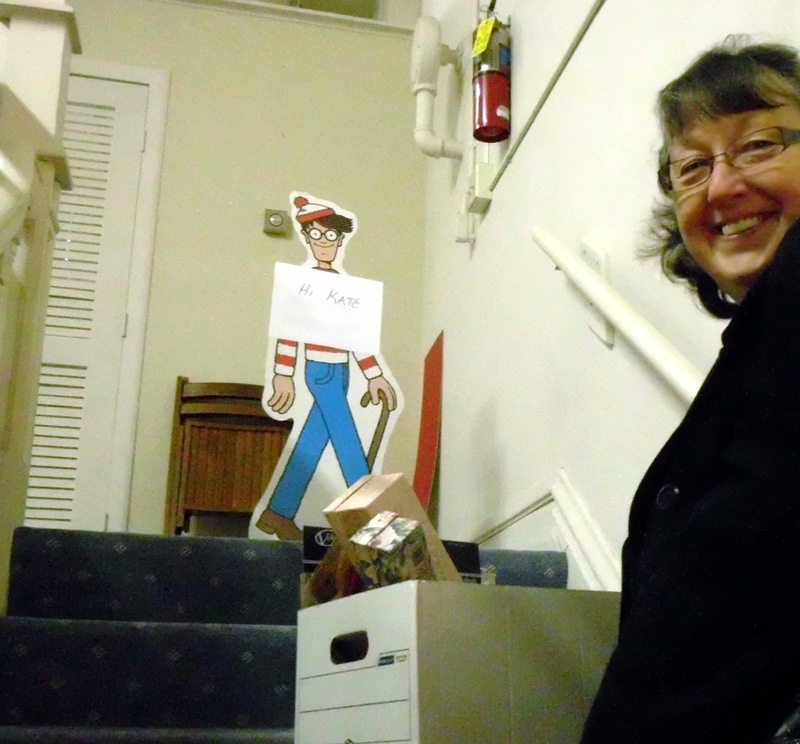 When I arrived, I was welcomed by Waldo. We hauled my boxes of stuff upstairs to join her boxes and piles of stuff. We "ouwwed" and "awwwedd" over it all, and the possibilities! 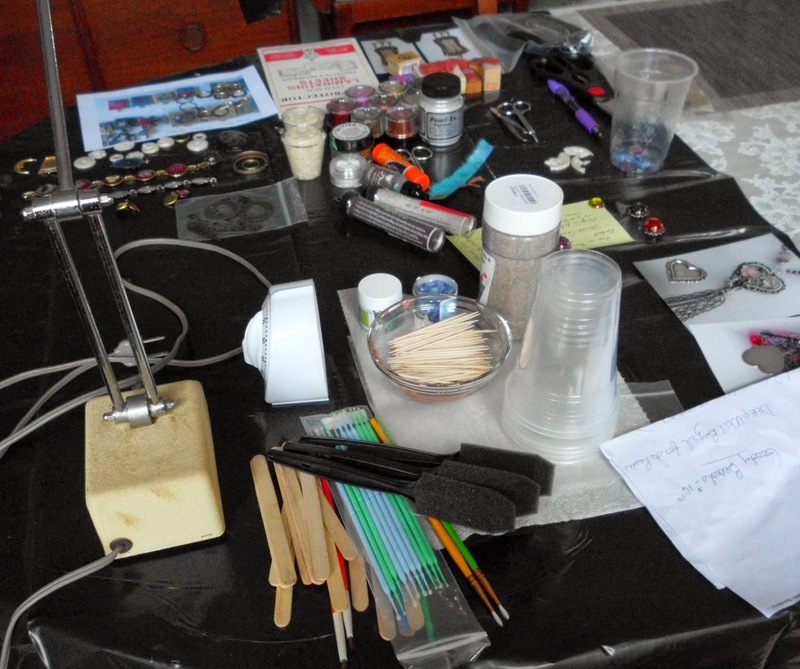 Here is our work table and some of the good stuff we wanted to use with Resin. 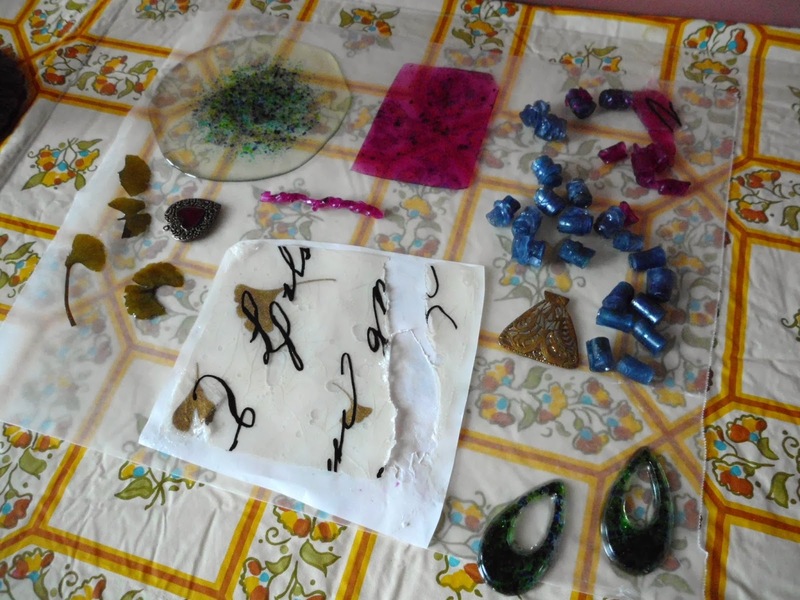 Some of the items we used included Alcohol Inks, Colored Sharpies, Old Book Paper, Specialty Papers, Dried Leaves, Lace, Old dryer sheets, decorative paper bags, wrapping tissue, paper beads and more. Our resin of choice: Ice Resin. Marianne had taken a bottom part of an egg shell, peeled the membrane away, then dried the shell. She brought it for me to use. What a friend! 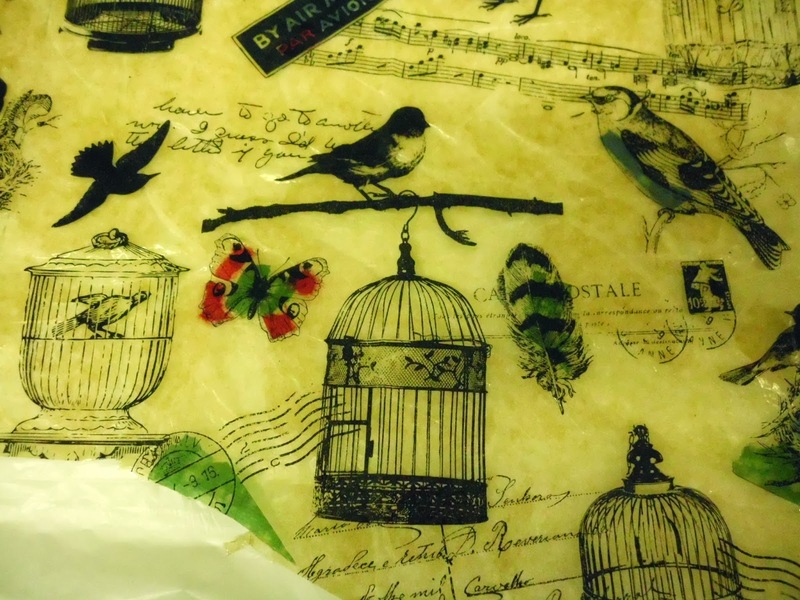 Marianne is a true Artist when it comes to using paper to create beautiful collages and decorative effects. She creates and sells extraordinary and unique Journals at her Book Store here in Marietta, Barking Dog Books and Art, as well as in her ETSY shop BookArtsAndEphemera . 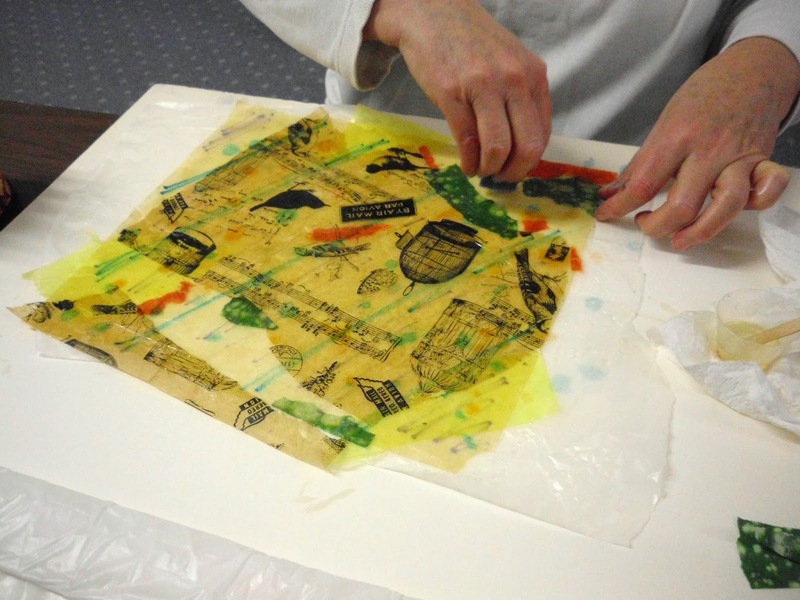 Here she is working on a piece, tearing papers and sponging with resin. I found that tearing and layering paper was a real challenge for me. It may sound easy, but it is not. 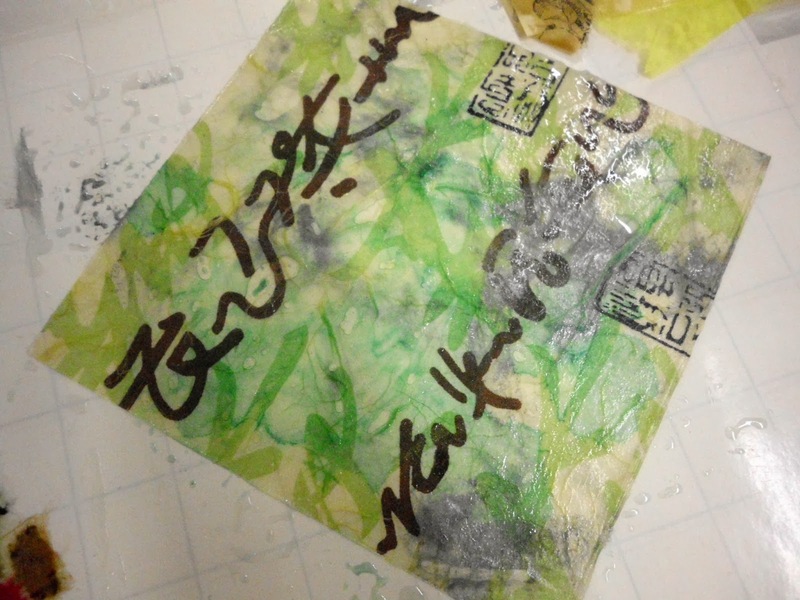 I have added resin to a single sheet of paper before, but had never layered. I enjoyed working with a pro! Here are some more of the finished pieces, waiting to dry. We placed our results on a separate table for them to dry. The table was full by the time we stopped for the day. I think we used almost two full size bottles of resin! We decided to take a break later in the afternoon for a quick walk to the nearby Antique Shop. She had wanted to show me some Chandelier crystals I might be interested in. Well......we spent hours in there looking and buying. I did most of the buying! Time got away from us and the store was closing when we checked out. It was after dark, and we both had to get home. 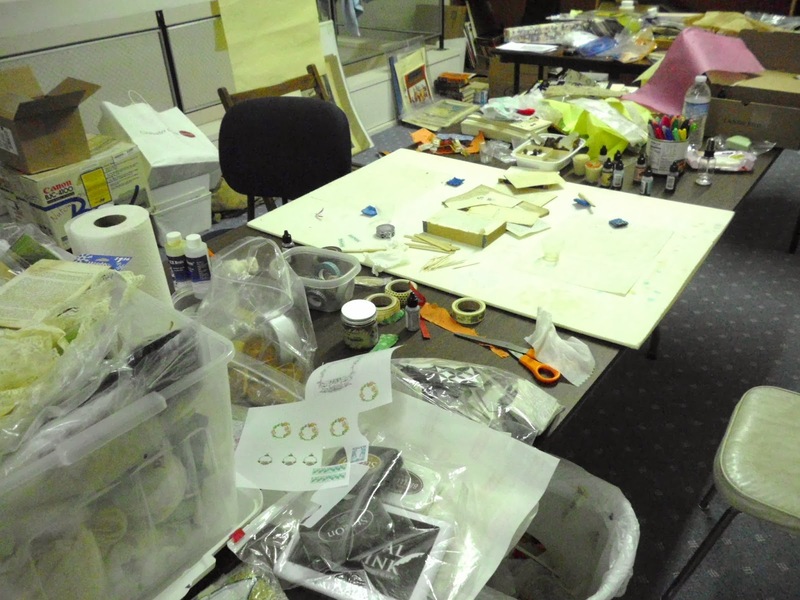 That is one of the great advantages of a creative studio....the mess can wait until tomorrow, next week, whenever. I have not had a chance to stop by and see how our pieces look now that the resin has dried. I can't hardly wait!!!! Marianne told me they are awesome! The results are transparent pieces that can be used to create whatever inspires the imagination. Jewelry? Journals? The possibilities are endless! 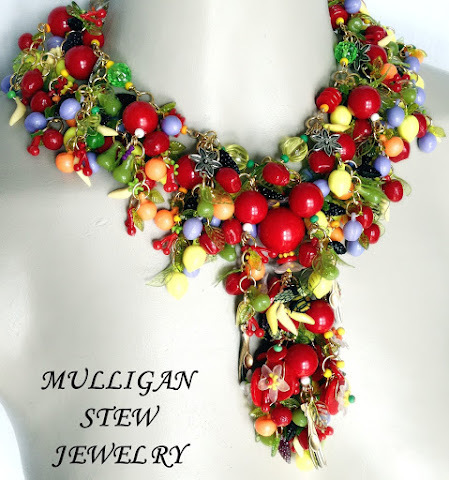 There are times that I like to just fool around with one or more techniques, mediums, whatever....that I use to make Jewelry. No end result in mind or with the purpose of creating a piece. Just messing with stuff. A few weeks ago, I was supposed to get together with a friend for an Ice Resin play day. We call ourselves the "Resinators". I got an abscessed tooth, and we had to reschedule. In the meantime, after I got the tooth issue taken care of, I scattered stuff all over my kitchen to mess around with some Ice Resin. I made puddle beads (and some puddles!). I added colors and textures using oil paint, alcohol inks, spices, even some glass frit. Glass frit is used by glass bead makers and stained glass makers. It is finely ground glass, in various colors. And I found out the hard way that some of it is sharp....duh, broken glass. I painted resin on some different types of paper and some dried leaves, bits and pieces of nature I have found (sticks, shells, butterfly wings). I made some small bezels by taking some wire, twisting it to make a closed opening...hmmm...does that make sense? Closed opening? Oh well, then I hammered the wire. I laid some small pieces of pretty paper on some wax paper, laid the hammered wire on top, and poured a bit of resin in. Worked really well. Usually I place a piece of packing tape on the back of an open bezel, then add resin, paper, etc. I used a mold with various sizes of round cabs, and added some resin with spices. The pieces fit nicely into some open bezel frames. I think I will use them for charms. I covered buttons with resin...those came out pretty cool. Then I had some old, large shank buttons with indents on them. I poured some resin in them. I thought those were pretty cool too. Anyway, I had a fun time. I got resin in my hair...talk about worse than bubble gum to get rid of! If I want a resin piece to have a matte finish, I can do that easily by spraying the dried piece with Krylon Matte spray. 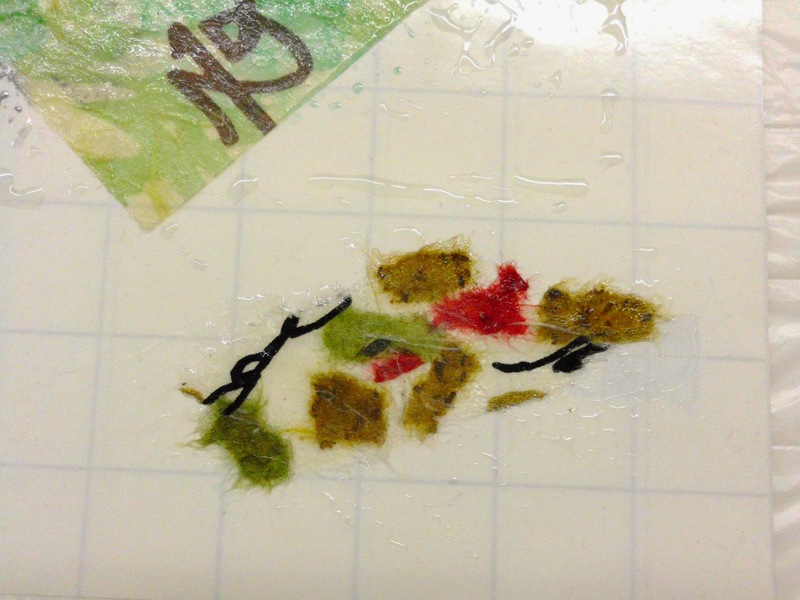 Dried resin can be easily cut with a pair of scissors. A puddle of resin, after sitting for about 4-6 hours, can be cut into strips and rolled into beads. A piece of scotch tape to hold the rolled bead until it dries completely keeps the bead from unrolling. Oil paints create beautiful colored resin. All I needed for a 2 ounce mix was a bit of oil color on the end of a toothpick. Alcohol inks will mix into the resin, and the resin will cure properly. Letting the mixed resin sit in the cup for a max of 20 minutes results in a thickening of it, which can be brushed on a dapt filigree to easily fill the openings. I don't know why I did that...just wanted to see if I could. That is the fun of fooling around with a medium. I try stuff just to see if it would work. I also find out some things that don't work. My friend and I will be getting together next week to fool around with Resin together. We both have some ideas about what to try next! Below are some of the results. The top left is a Resin Puddle. I have no idea what to do with that. The blue pieces are the beads. Oh, forgot to mention the heart. I took two metal stampings that I got from B'sueboutiques.com. An open heart and a closed heart. I filled the bottom heart with some colored resin, then pressed the top heart on. The resin domed in the opening and looks like a gemstone.